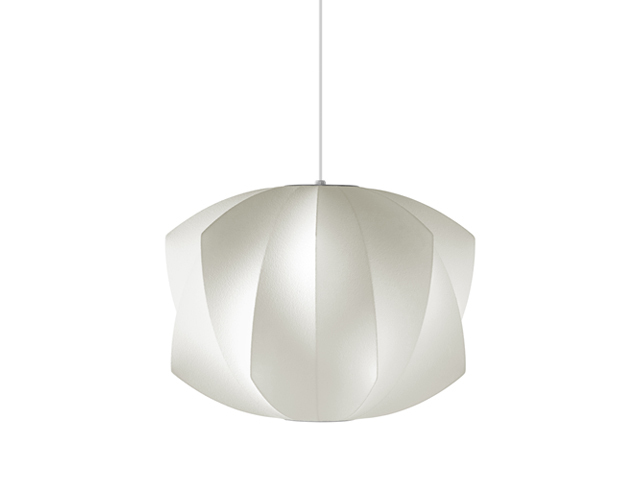 Part of the Nelson Bubble Lamp series, the Nelson Propeller Bubble Pendant has a sculpted quality with angular twists in the shade. It’s designed to delicately float overhead and add charm and personality to any room. George Nelson designed the series in 1952. He was inspired by a set of silk-covered Swedish hanging lamps. Use with up to 32 watt CFL bulb. Light bulb not included. Hardwiring required. The Nelson Propeller Bubble Pendant has a striking presence due to the angular indentations in its under-structure. This sculptural pendant light comes with a brushed nickel-plated steel ceiling plate and a 6-foot-long cord to affix it to the ceiling. Nelson designed the Bubble Lamps in 1952, when he came across a set of Swedish hanging lamps and wanted one for his office. “One day, Bonniers, a Swedish import store in New York, announced a sale of these lamps. I rushed down with one of the guys in the office and found one shop-worn sample with thumbmarks on it and a price of $125,” Nelson wrote. The steep price tag, for that time, prompted Nelson to design his own. One of the most influential designers of mid-century modernism in America, George Nelson served as Director of Design at Herman Miller for more than 25 years. During this time, he designed iconic pieces like the Marshmallow Sofa, elegant storage furniture like the Thin Edge series, and curated what became known as the Herman Miller Collection, a comprehensive set of products “designed to meet fully the requirements for modern living.” The Nelson Bubble Lamps, with their delicate, floating quality and multiple variations, were designed to enhance the experience of modern living. In 1952, Nelson was inspired by a set of silk-covered Swedish hanging lamps that were lovely, but expensive and tedious to craft. “The Swedish design was done in a silk covering that was very difficult to make; they had to cut gores and sew them onto a wire frame. But I wanted one badly,” Nelson wrote. He designed the first prototype with a white plastic spray that was used by the U.S. military after World War II to create a protective covering for military ships and planes that were being stored at the time. He fashioned the basic spherical wire cage, and then sprayed it with this resinous lacquer. A final coat of plastic was applied, giving the shades their smooth, translucent skin. Today, Nelson Bubble lamps continue to be made the same way, with slight updates to extend their durability. Use with up to 32 watt CFL bulb. Light bulb not included. With regular care and maintenance, your Herman Miller product will provide years of superior performance and satisfaction. To maintain the finish quality of your Herman Miller product, please follow the cleaning procedures provided below. The instructions for the care and maintenance of Herman Miller products are provided to you as a service. No warranty is implied since results may vary. Avoid using glass cleaners, abrasive cleaning compounds, ammonia, or bleach; they may damage the surface of the plastic and result in discolouration. Make sure cleaning materials are free of grit and other foreign materials.